I already have a 150 count plastic case full of goalie cards so far, and I received a package of goalie cards this past week that I still need to write a post about. So, with a need to get some posts out there on the blog, I'm going to try and post a handful (or more) masks for the next few days. We're only about 3 weeks away from NHL training camps opening, so why not? 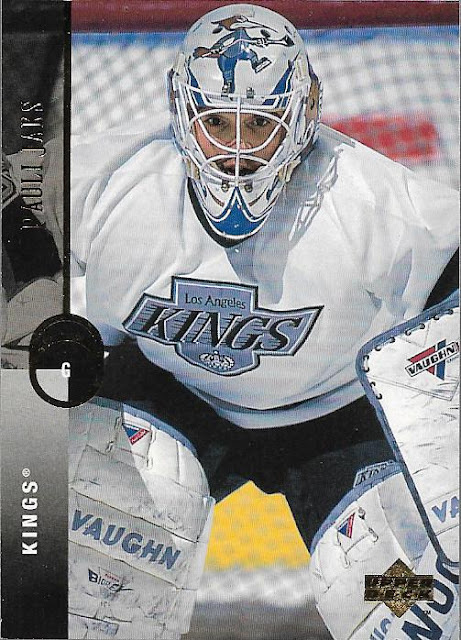 Jocelyn Thibault had some great masks during his NHL career, and the one he sported on this Pacific Complete set from 2002-03 is no different. Even the "T-BO" on his chin looks great. This is card #411. I don't normally like to be harsh on athletes, but maybe the only thing that was good during Toskala's time in Toronto was his mask. This video might be the defining moment. 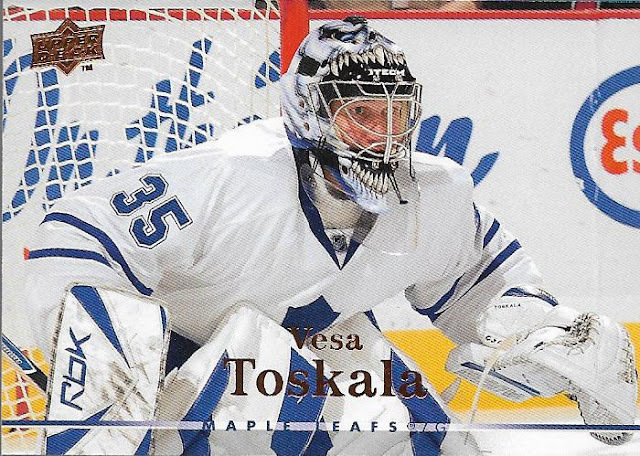 Vesa lasted a couple more years in the league before returning to Finland to finish his career. This 2007-08 Upper Deck card is number 397. Sometimes you just never know where you're career will take you. Niemi wins a Cup in Chicago in his first year, is traded to San Jose where he has 5 solid years, then ends up in Dallas and becomes a back up. 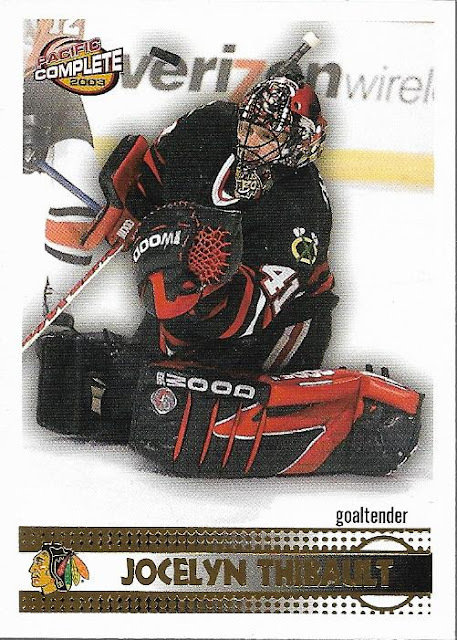 I remember picking up packs of 12-13 Score hockey at K-Mart like it was only yesterday, but this is already a 5 year old card. 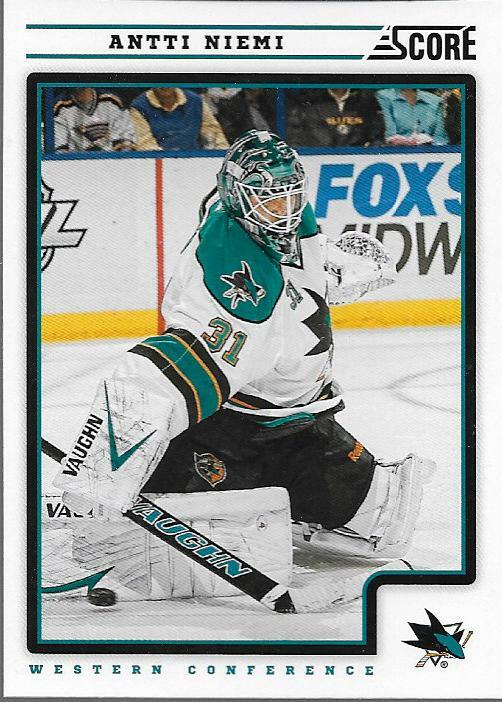 Niemi is #392. Most of the names you'll see in this frankenset you'll recognize, but even the most ardent hockey fan might be troubled to remember Pauli Jaks. This photo was more than likely taken during his only NHL appearance, where he played 40 minutes and gave up 2 goals. The mask represents his time in the IHL with the Phoenix Roadrunners. This is card #387 in the set, and is part of one of my favorite UD sets, 94-95. 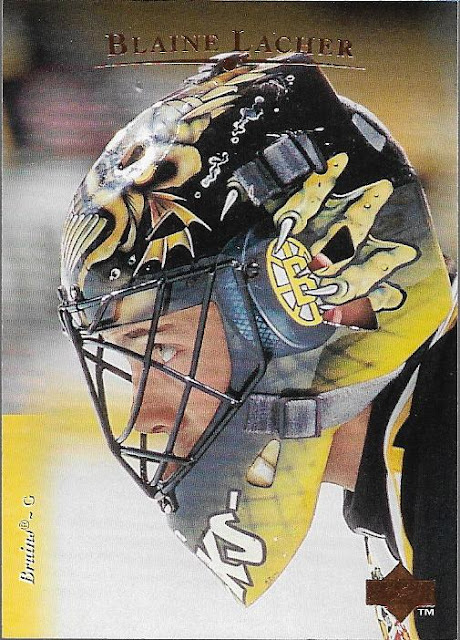 The Loch Nets Monster, Blaine Lacher, who lasted just two seasons in the NHL. This might be one of the best mask shots that will appear in the set. This is from the 95-96 UD Set, and is card # 385. Love the claw grabbing the puck on the side of his mask. Fantastic. I thought that Jhonas Enroth was going to be the answer as a back up in Toronto this year. 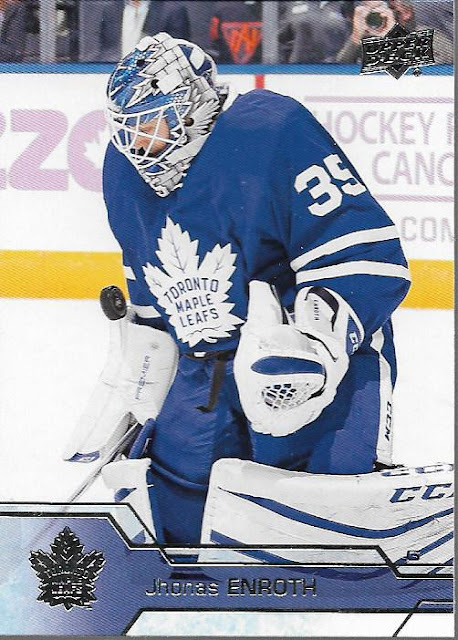 Instead, this is the only base card from Upper Deck that Jhonas will appear on as a Maple Leaf. Good shot though of the big Maple Leaf, ironically in front of a brick wall. At least there's a goalie in spot #424 now. There's another half a dozen spots off the list. Still have a lot more ground to cover though, and I'm going to try and get through a bunch of cards this week. There are some very solid images in there! Great stuff! Love that Blaine Lacher card. Loved Niemi when he was here in SJ. Great guy. He was always willing to hang out and sign for fans. Love the goalie cards and glad you share them here. it helps me fend the urge to collect these.